There are few new approaches when it comes to strength training machines. As opposed to free weights, these machines provide a very rigid direction for various exercises. That makes them very effective since it is hard to do a movement wrong. However, the Body Solid G10B Bi-Angular Home Gym does provide one extra benefit that is a step above the average home gym. The bi-angular motions works in two separate directions at once, giving you far more value for each movement. Applying resistance in two directions gives the standard strength training additional isometric benefits which increases the efficiency of any exercise by up to 25%. 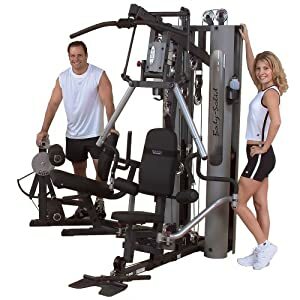 Along with the fact that the Body Solid G10B Bi-Angular Home Gym's many stations give you the most options for a variety of exercises to work every part of your body, it also allows multiple people to use it at once. For couples or families, that can really have a positive impact on togetherness and fitness for everyone. Chest Press: great for working the shoulders, pecks and even upper back. Lateral Pull: Works the biceps and shoulders. Row Station: Gets your abs, back, arms and legs all working in unison to provide a full-body workout. Leg extension: for those hamstrings, calves and thighs has adjustable cams to make it a perfect fit for any member of the family. Ab crunch: gets your core muscles in gear. Pec fly station: for a super upper arm and chest workout. Multiple hip station: gives excellent definition to the hip, thigh and buttock areas. The Body Solid G10B Bi-Angular Home Gym comes with a DVD with exercises and multiple ways to use each station for the maximum benefit. It also comes with a chart for quick selection of routines. In total, there are over 50 exercises you can perform on the Body Solid G10B Bi-Angular Home Gym. This is not just some average, ordinary piece of equipment you can pick up anywhere, the Body Solid company is a leader in gym quality equipment, and has several decades of top performance in the fitness industry to back it up. The Body Solid G10B Bi-Angular Home Gym is backed by a lifetime warranty, and comes with both a home gym certification and a commercial quality certification. The Body Solid G10B Bi-Angular Home Gym comes with two sets of weights at 210 pounds each. 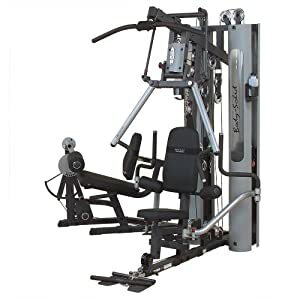 This provides a maximum setting of up to 420 pounds on any exercise which is more than enough for the most dedicated users. However, if you still feel you need extra punch, you can upgrade your unit to include an additional 50 pounds of weights on each stack for a total of 520 pounds. The Body Solid G10B weight stacks are safe and secure, and encompassed in an enclosed tower to prevent pinches or accidental injuries from falling weights. The weight selection is easy to do from any station, and uses a pushpin method of changing levels that is simple for any member of the family. One of the Body Solid G10B's greatest benefits—it's durable, strong framework, and many work stations can also be a drawback in certain circumstances. This, like most large multi-station gyms is a very heavy piece of equipment. If you are going to install this in an upper level of a home, or above the first floor of an apartment or condo, be sure and find out if the structure can handle over a thousand pounds of weight in one place. The Body Solid G10B Bi-Angular Home Gym alone weighs in at 941 pounds on its own with the two original weight stacks. It is upgradable for up to 100 (50 pounds on each of the two stacks of weights included) additional pounds of weights, and with even just one average person using it, the weights can exceed 1100 pounds in just a few square feet of floor space easily. You need a large amount of floor space for the Body Solid G10B Bi-Angular Home Gym. It is over 8 feet wide, and 6 feet deep. That can be a tight fit for small homes, apartments or condos. The G10B stands 7 feet high at its tallest spot. Make sure you measure your floor to ceiling space as well. That's fine for most average-sized homes, but it is better safe than sorry. This is a top-tier machine, and because it is gym-quality it is on the higher level in the cost category. For anyone who is serious about the long-term benefits of having a gym in their home, this is the machine to consider. It can be a little pricey for beginners, and those who are not sure if they will continue to use it. This is as good as it gets for home gym equipment. Body Solid has a strong reputation as an industry leader, and the Body Solid G10B Bi-Angular Home Gym is perfect for people serious about getting in shape. The Body Solid G10B Bi-Angular Home Gym qualifies for the FREE with Super Saver delivery at Amazon.